Universally, the celebration of a festival is centered around a lot of good food. After all what better to bring a family together than a wonderfully put together meal. Festive food is usually in keeping with traditions and the history of the festival itself. 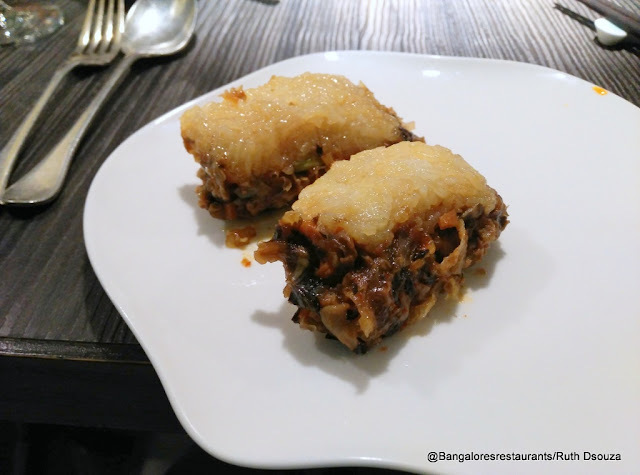 The great thing about Bangalore's Restaurants, especially the specialty ones, is that we, right here in the city, get to savour some of the best festive food around without having to get out of the country. The month of June is dedicated to the Dragon Boat festival in China and is celebrated to commemorate the life and death of Chinese scholar Qu Yuan (Chu Yuan). Dragon Boat racing is an integral part of this national holiday of China. It is said to have originated when boats were taken out to look for the body of the scholar who reportedly drowned in the Milou River. Legend has it that packets of rice were thrown into the river to ensure that the fish did not eat the scholar's body. And thus the origin of the tradition of eating zongzhi, along with rice wine developed. 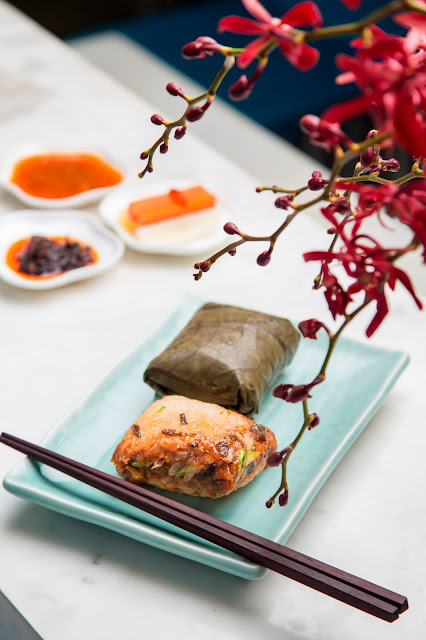 We were invited to Yauatcha to sample the the Zongzhi - steamed rice, layered with meat and vegetables. 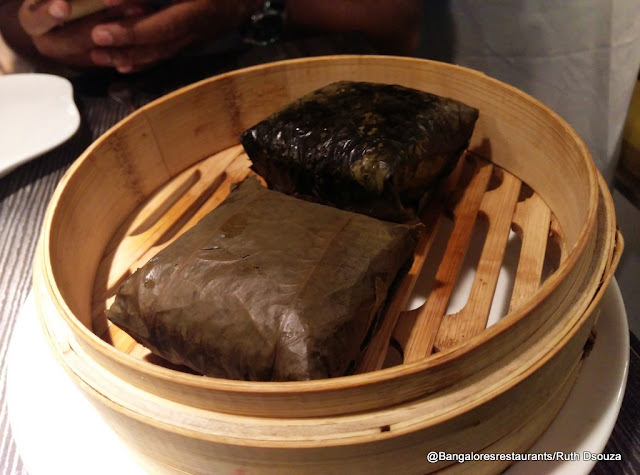 Each of these are wrapped in leaves and brought to the table in bamboo steamers. They are they unpacked right before you and the steaming goodness is all that is needed to whet the appetite. 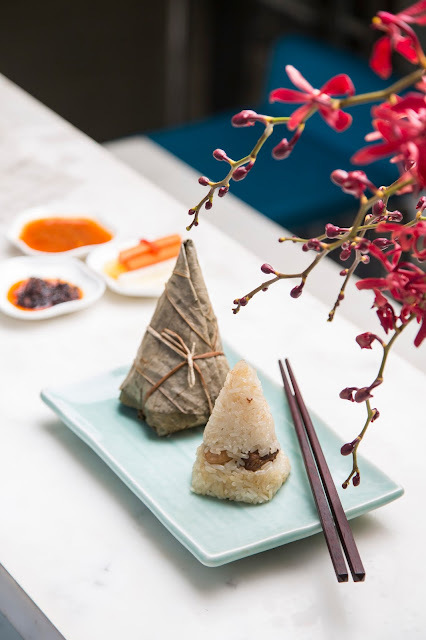 The menu has been designed by Chef Wang Yixuan, Head Chef of Yauatcha, India. The festival is currently underway and will be on till the end of the month. There are six versions to choose from, 2 vegetarian and 4 meat based. We sampled each of six offerings. Here is a look at what we had. Accompanying the meal is a Chandon Spritzer - with vodka, dry vermouth and lime. 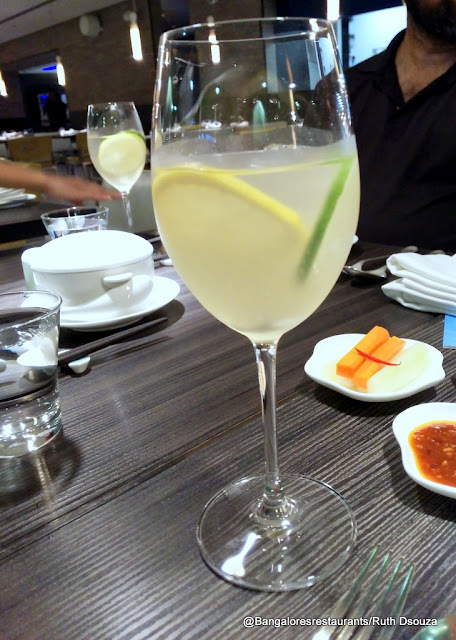 Its a citrusy drink that is light and makes for a nice accompaniment to the steaming zongzhis. The dessert - Wine-soaked water chestnut and mango cake with Sauvignon sorbet. This was the highlight of the meal with every element being a delicious treat in terms of texture, flavour and being a visual treat as well. The festival is on till the end of the month. 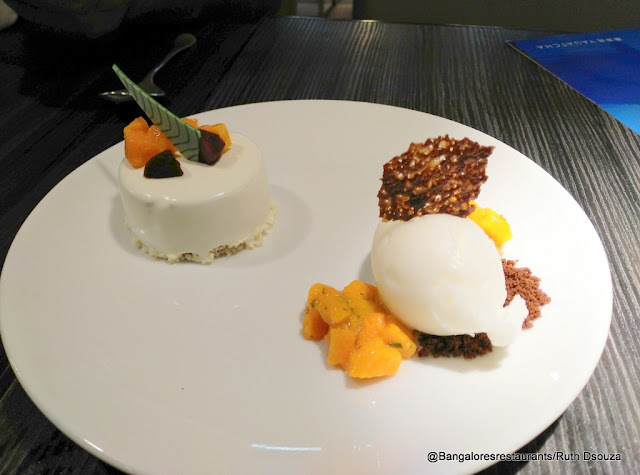 Yauatcha has a lovely ambience whether you dine there in the afternoon or at dinner. Service is friendly. What you must keep in mind though that Zongzhis are rice heavy and so you may not want to make a meal of only these. Choose to pair it with some options for the great a la carte menu that is on offer. 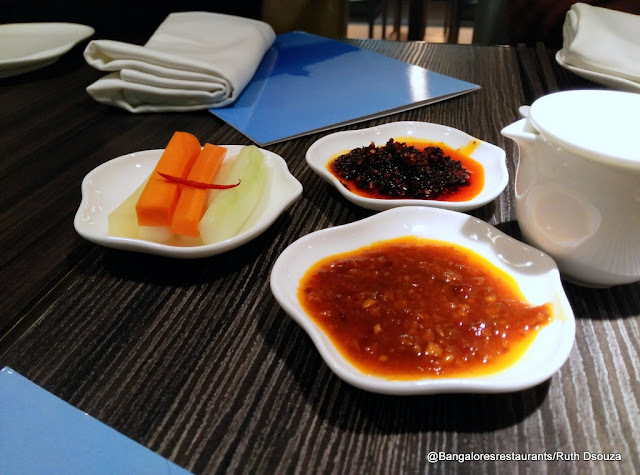 My top picks of the Zongzhis were the sticky rice in lotus leaf and asparagus and the Pork Belly with Shiitake mushroom. A meal here is in the range of Rs 2500 for two.